Magnetohydrodynamics MHD - Power, Thermionic Power Conversion. The field of MHD was initiated by Hannes Alfvén , for which he received the Nobel Prize in Physics in 1970. 1). MHD is in the field of Plasma Physics that deals with the study of the dynamics of an electrically conducting fluid in the presence of a magnetic field. A MHD generator is a device that produces electrical energy from an electrically conducting gas/plasma flowing through a transverse magnetic field. 2). Magnetohydrodynamics (MHD), or magnetofluiddynamics, is the academic discipline, which studies the dynamics of electrically-conducting fluids. It is the study of the motions of electrically conducting fluids and their interactions with magnetic fields. Examples of such fluids include plasmas and liquid metals. The set of equations, which describe MHD, is a combination of the Navier-Stokes equations of fluid dynamics and Maxwell's equations of electromagnetism. 3). Magnetohydrodynamic (MHD) generator - Plasma moving with velocity - perpendicular to a magnetic field - generates an electromotive force - perpendicular to both the direction of plasma flow and the magnetic field. This dynamo effect can drive a current in an external circuit connected to electrodes in the plasma, producing electric power without the inefficiency of a thermal cycle. In a MHD generator, the solid conductors are replaced by a gaseous conductor, an ionized gas. If such a gas is passed at a high velocity through a powerful magnetic field, a current is generated and can be extracted by placing electrodes in suitable position in the stream. (1) Temperature, Ionized by Hot Combustion Gases. The Super Hot Plasmas is than in a State of Excitation Which Makes it Give off an Electrical Current when Passing Through a Magnetic Field. The High Temperature Creates Lose Electrons that Gives off Electricity to the Electrodes in the MHD Channel. A plasma is Typically an Ionized Gas. Plasma is Considered to be a Distinct State of Matter, Apart from Gases, Because of its Unique Properties. Ionized Refers to Presence of One or More Free Electrons, Which are not Bound to an Atom or Molecule. The Free Electric Charges Make the Plasma Electrically Conductive so that it Responds Strongly to Electromagnetic Fields. (2) Speed of the Plasma; The Faster the Speed of the Plasma the More Electricity is Generated When Passing Through the MHD Channel. The Working fluid is Introduced Into the MHD Generator Through a Nozzle. (3) Type of Ionazable Mixture used as a Working Fluid. Ionization is a Process in Which Electrons are Removed from an Atom. Alkali Metals will be used, Such as Potassium Carbonate, Lithium, Sodium and Cesium. Which are Seeded into a Inert Gas - Convenient Carrier such as Helium or Argon. The Liquid Metal Provides the Electrical Conductivity. Conduction is Due to the Free Electrons and Positive Ions Which Move Under the Effect of a Magnetic Field. 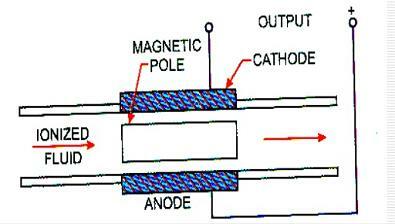 (4) Magnetic Field Strength, the Greater the Strength the Higher the Electrical Output. The principles of MHD have been known since the studies of Michael Faraday in the 1830's. However, the first attempts to construct a large MHD generator, made in 1938, were unsuccessful due to poor knowledge of the plasma properties. By 1959 the understanding and the technology progressed to the point that 10 kW of electric power was generated in an MHD device. Wires are solid conductors and ionised gas are liquid conductors. Magnetohydrodynamic (MHD) conversion processes offer a highly efficient, clean and direct conversion of energy for power generation and propulsion. Solar/Gas/Biodiesel MHD power generation innovation has the potential to launch an entirely new electric power generation. CSPU Magnetohydrodynamic topping cycle generator creates higher efficiency for existing power plants. Even a small energy savings could make a big difference. MHD topping cycle generators will reduce the cost of electricity, improving the overall efficiencies of the system. 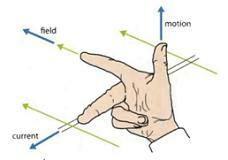 The flow (motion) of the conducting plasma through a magnetic field causes a voltage to be generated (and an associated current to flow) across the plasma , perpendicular to both the plasma flow and the magnetic field according to Fleming's Right Hand Rule. Magnetohydrodynamic (MHD) power plants offer the potential for large-scale electrical power generation with reduced impact on the environment. CSPU MHD generators can maximize the energy benefits of both new and existing power plants, by increasing their power output capacity and overall system efficiency. This is done by using a MHD “topping cycle,” which utilizes the incoming higher temperature heat before it enters conventional electrical generators. Solar, Geothermal and industrial waste heat can also be used. In the 1970´s and 80´s MHD was pursued as technology that could improve the efficiency of coal-fired power plants. MHD stand alone units can convert energy into power more efficiently than other types of power system. The system will also be incorporating the stacking of heat engines to increase the overall efficiency. MHD is more efficient than power plants operating at comparable temperatures. The MHD heat source may be combustion of a fuel, solar, geothermal, chemical reaction, or waste heat in the form of a hot gas. In addition, the direct conversion of thermal energy to electrical energy eliminate the inefficiencies associated with thermal-to-mechanical and then mechanical-to-electrical energy conversion.